For this Walk with Him Wednesday, Ann Voskamp of @ Holy Experience has asked us to share Scripture we've been memorizing. The older I get, the harder it is to memorize but I'm determined to not let that stop me. I need to do this now more than ever. And besides, I've stated it repeatedly on Heart Choices ...I am a life long learner. If I have to share one emotion that I struggle with most in my life, I would have to say it would be FEAR. As I recall things I worried about in the past, the majority of them never occurred. Such wasted moments spending precious time fearing the future unknown. My good friend Terri has often reminded me over the years that most of what we worry about never happens. Terri is one of those people who strives to live in the moment and enjoy each day to its fullest. I have this verse laminated on a card that sits right under my computer screen in my home office. This way I can easily glance down to memorize it. The phone rings. My immediate fleshly response is ...what now? 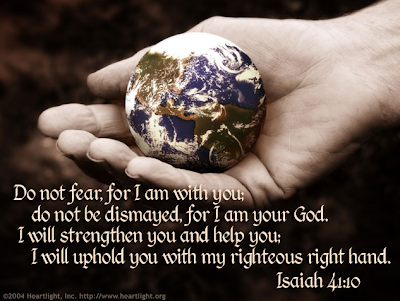 But I glance down at Isaiah 41:10 and ...remember. God is with Debbie. Debbie does not need to fear. He will strengthen Debbie and help her. The Lord God Almighty will uphold Debbie with His righteous right hand. I answer the phone and continue my day knowing that ...I have nothing to fear. and thank you for your sweet, sweet comments on my site. I too have struggled with fear. The verse that I always speak out loud when I'm surfing the tide of fear is, "God has not given us a spirit of fear, but of power, and of love and and of a sound mind." 2 Timothy 1:7. I'm going to add Isaiah 41 to my list. Thank you. Isn't it amazing how God uses different Scriptures to help us deal with the same thing. Jessica has another good one too. All of these will be added to my "fear" verses to memorize. Oh this is SO good and you are NOT alone!! I am still coming out of the fear and you know what song really hit me about it? You Never Let Go by Matt Redman. Ever heard of it? The lyrics are AWESOME. God used that to remind me I have nothing to fear. This is an answer to my prayers...reading this scripture this very day at this very moment. But that is how our Lord works in our lives when we call out to Him. He never leaves us. Great post! I have trouble memorizing scripture, too. Always have. So, I keep favorite verses on index cards, carrying them in my purse. If I need them, I pull them out and begin reading them. What a comfort God's word is! Fear is something that I do struggle with and a lot of times, it's not really justified and leaving me with, "Why do I fear this or that?" I need to post that verse where I can see it. Thank you for sharing this encouragement. My blog this week is on this very same verse. I think we all struggle with this fear thing - but God for sure has this conquered and covered. It sure becomes easier when we just take Him at His word. He is teaching us on this, and these scriptures just write in on our hearts. Add me to the list of "fear" people, too. Unfortunately. I have wasted so much time on worrying about things that may or may not happen. Either way, the worrying ahead of time did nothing to help. It's a sin that I so often ask the Lord to forgive me for and that I want to stop doing. So thank you for posting this today. May the Lord give us all greater faith! Powerful message Debbie! Unsure if you knew that Isaiah 41:10 along with Psalm 27:13-14 are both foundational life scriptures for me. Both taught to me early on by my Grandma. I understand what you mean about fearing those things which ended up never happening. I think for me my experience was the FEAR of those things which were already happening to my life particularly in my child hood. No matter what the cause fear can be so crippling. Thank GOD for HIS power being greater!! We can trust in Him and fear not! This is something that I have to remind myself... that I need to respond with the perfect peace of the Lord! 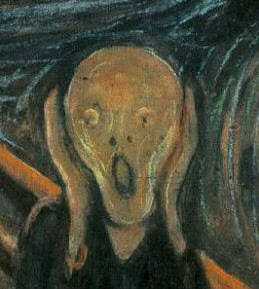 I also have been known to hold my breath in anticipating an unknown bit of news. Like when our son would have to go in so frequently for his scans during and immediately after the chemo treatments. I would sit there watching along with the radiology techs and couldn't wait til it was all done and we ere out with the good reports of clear scans!